It's hard to imagine that just a few years ago, the average consumer wasn't familiar with interactive, touchscreen technology—so much so, that he probably wouldn't have recognized it if he saw it. Now, with the proliferation of iPads, smartphones and other touchscreen gadgets, consumers not only recognize the technology: they gravitate toward it. And, as Monster Media has discovered, that's making interactive advertising a very interesting field indeed. 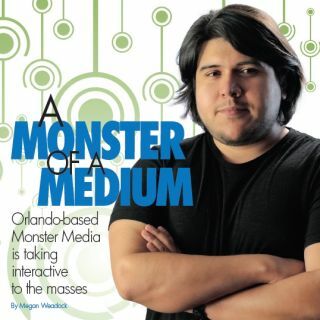 Monster Media was founded in Orlando in 2004. The international, full-service media company provides distinctive digital media installations throughout their global network, specializing in digital out-of-home (DOOH) advertising. The company is especially well-known for its work with interactive technology. Monster Media's campaigns can be found across an impressive array of platforms, including in airports, hotels and malls; at events and sports/entertainment venues; and on mobile tours, college campuses, bus shelters, newsstands, storefronts and mass transit. Their client list reads like a who's who of forward-thinking advertisers: The Academy Awards, Blackberry, Chevrolet, Coca-Cola, Dell, ESPN, Estée Lauder, Ford, General Electric, HBO, IBM, JetBlue, Katy Perry, MTV, Reebok, Siemens, Target, Universal Studios, VH1, Walt Disney, Xerox and more. If you've ever experienced an interactive installation, there's a chance it was Monster Media's. The company does it all: indoor and outdoor installations, semi-permanent structures and fully-customizable portable units, and more. They provide 3-D mapping technologies, mobile phone control, gestural, touch and augmented reality installations. Really, if a client wants something, anything, made interactive, Monster can make it happen. In that spirit of support, Monster Media spent six years developing a unique 24/7 back-end monitoring and maintenance program that allows them to proactively respond to technology and display issues. Also, each touch-enabled unit comes equipped with a proprietary analytics program that analyzes the success of each installation and provides a tangible ROI to clients. Considering the company's current status, Monster Media's relatively humble beginnings are a testament to the hard work and incredible vision of its team. Pedro Andres Sanchez, the Senior Vice President of Creative Technology at Monster Media, has witnessed first-hand as the company grew from start-up to industry-leader. He joined the firm in 2006, just as its owners were tweaking their focus from non-traditional, out-of-home advertising to interactive. “Back then, we were dealing with a lot of projector technology,” he said. “People would walk by, and they could interact with it. We had a network that featured a lot of entertainment venues, arenas, etc. We also started that year with an installation in the [Las Vegas] McCarran Airport with a projection system. We did several projection installations before we started our push with the current screen systems that we have. Sanchez is no stranger to out-of-the-box thinking. He's been in the digital media world for 11 years, working on projects that included motion graphics, corporate branding, interaction design, e-commerce, web development and, yes, even print marketing. At Monster Media, Sanchez leads all technology and creative efforts, a role that greatly appeals to his passion for immersive multimedia. When Monster Media formed in 2004, the release of the first iPhone was nearly three years away. The concept of “touchscreen technology” was still relegated to sci-fi movies, modern slot machines and the occasional video game. Interactive digital media was just a twinkle in the industry's eye. Today, Sanchez is happy to report, the technology is everywhere. Sanchez said the interactive media industry was transformed after gadgets like the iPhone and the iPad went mainstream. As anyone in marketing knows, the Holy Grail in any campaign is the ability to keep the audience engaged—at least long enough to get your message across. Interactive signage accomplishes that and more, drawing in consumers for significant periods of time and leaving them feeling entertained and satisfied. This is especially true in places where people are often waiting for long periods of time, like airports. When you're stranded or waiting for a flight, any distraction can be a welcomed one. And with an interactive display, it's a win-win situation: The advertiser gets their point across, while the consumer passes a little time and has some fun. Not that interactive technology is without its challenges. As the installations grow in popularity, there continue to be obstacles to overcome, Sanchez is quick to point out. First and foremost, you have to consider your audience and environment. For example, Monster Media created a mobile advertising campaign for the Monterey Bay Aquarium that ran throughout the summer. In this case, a portable storefront was ideal: The truck brought a unique underwater experience to thousands of people in the San Francisco area to promote the aquarium's sea life. The truck's network doubled as a Wi-Fi hotspot, enabling consumers log in and create their own scuba diver via a mobile web application. Using their touchscreen devices, consumers guided their diver to sharks, penguins, jellies, sea turtles and sardines to collect badges. Divers could even post their deep-sea encounter on Facebook to share with family and friends. Sanchez said the Monterey Bay campaign was a hit, with many users spending significant time at the truck and then sharing their experiences through social media. As interactive technology continues to grow in popularity, Sanchez believes its use in advertising will only increase. Sanchez also bets that we'll begin seeing interactive in more theaters; in fact, Monster Media did a pilot program with NCM last year to test the waters. More than anything, he says, fun, engaging campaigns are going to become the gold standard—especially when they're tied in to mobile. This is good news for advertisers and the digital signage industry. After all, this technology has the potential to engage consumers like never before. Interactive campaigns are only as good as their creative content and the success of every campaign depends heavily on this. Monster continues to transition into a content driven company, focused on providing the right content for the right networks, to engage intended target audiences and deliver result based analytical data to clients.